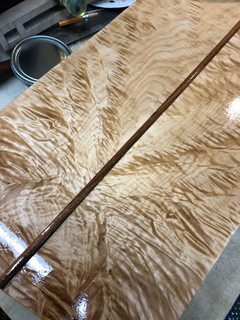 I must’ve read 50 opinions/articles here and elsewhere on finishing hard maple and still I managed to not do justice to mine. I have two large Salem-brand maple dressers bought new by my grandparents in the ‘80s. They passed recently and I wanted to refinish them nicely and hang on to them (the factory finish was in rough shape). I stripped them, spent my off days for weeks sanding them (80 on up to 220), and finally came to the home stretch. Wary of blotching and on more than a few suggestions, I went with “natural” Watco Danish Oil. I’d used it before to wonderful results on another project, so I felt good about it. Needless to say the maple blotched pretty badly. There’s some beautiful quilt character to some of the wood and the oil did a great job of bringing that out, but it also brought out some heavy blotching in places. I was beside myself. In any event, today I started over by stripping them with methylene chloride. That got maybe 65% of it out, so there’s a lot of sanding ahead. What I’d like is some suggestions on how to tackle this the second time around. The goal, of course, is to bring out the figure as best I can, but this time while keeping it as close to a natural and/or light color as possible, and obviously to avoid blotching. As mentioned, the Danish Oil was great in some places. It turned the pieces a little more amber, even “orangey,” than I liked, however. Keeping in mind that I’m a bit of a novice, how should I finish them this time? I’d like to give ‘em a little more character than just a few coats of clear poly. I sure would appreciate the advice. You didn’t try it on some test boards first? In all your reading did no one mention blotch control? Blotch control products or homemade blotch concoctions. 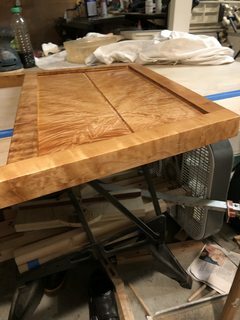 I did pull an internal piece, also maple, and tried it on that (sanded to 220, etc). One side on top of a pre-stain conditioner and the other with just oil. There was little if any difference that I could see, but the piece wasn’t huge (maybe 2.5×12”). No blotch in either sample. I was told more than once and read more than once I’d be fine if I went with the “natural” oil, too. It was anything with “color” I needed to worry about, the advice went. As I’m sure you know, for every one article/website saying no worries, there’s another saying you’d better. Danish Oil under the bridge now, of course. Lesson learned. So what’s my play? Thanks. Maple is notorious for being blotchy, in fact, the quilted look is due to a desirable blotching of the maple. Unfortunately, it’s obviously not a good look in other areas of the wood you have. You may want to watch Charles Neil’s videos on blotch control. He has his own product that is the best control you’ll find, but that doesn’t mean you have to buy it, if you don’t want to. The information is still the best I’ve seen on why stain blotches, and the limitation of blotch control. As for what you can do, several things come to mind, but none of them are pretty. Probably stripping off the oil and starting over would be your best bet. Do a search right here on LJ for ’’blotch control’’ in the search box. Cherry can have the same problem, as can walnut. Sander sealer seems to be the best approach for blotching, but even then you might seem some blotches, just not as bad. General Finshes has Seal-A-Cell or Zinnser sanding sealer both work well for me before using a stain, Watco, or finish. After much testing on scrap, the Charles Neil blotch controller (not what he actually calls it) was the one that worked on the maple toy chest I made. For best results, it needs to be used as directed, so read the directions carefully. Thanks for the heads up on Charles Neil’s product. Big help. I watched a vid and plan to order a jug. My main question is what you guys would suggest as a finish this time around given that I want to keep it natural, or at least light, while also bringing out the figure. The Danish Oil was a little too “amber/orange” for my taste, at least as I applied it. Any suggestions there? I’d like to do something with a little more character than just a few coats of poly. My main question is what you guys would suggest as a finish this time around given that I want to keep it natural, or at least light, while also bringing out the figure. For bringing out the figure in maple I used Chas. Neil’s trace coating technique and General Finish oil based semi gloss. Posted about it here. Once it’s dry I used .0000 steel wool so it has that “natural” wood feel. That’s fabulous. Thanks a ton for sharing. That s fabulous. Thanks a ton for sharing. You might also want to contact Charles. (member here). The trace coating technique is like the reverse of blotch control in a way because it actually accentuates the figure rather than blocking it. What is blotch (I think) is the stain adhering to different textures of the wood, which is what the figure is. Seems that if you blotch control it that will hamper trying to enhance the figure so they might be mutually exclusive. I’m a newbie so that is why I suggest contacting Charles. He’s good about responding. Maybe PM him with a link to this thread. I’ll do that. After watching both the blotch control and trace coating vid(s), that’s what I’m thinking: How can you both sharpen the figure with trace, while also controlling for blotch? Do do like what it does to the figure, though. 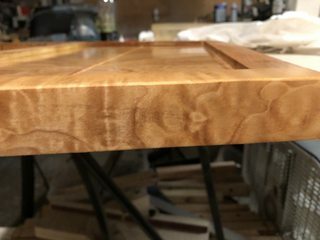 Challenge is that sanding doesn’t get rid of all the sealer, so what worked well on ‘raw wood’ with the Watco, isn’t great for refinishing… unless it was a raw oil finish before. The Charles Neil Blotch control is great, as is a shellac. 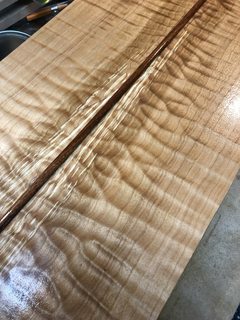 Likely going to need to use (if not the Charles Neil stuff) some kind of sealer like seal a cell, or a light cut of shellac to make the finish absorption more even…. you have a situation where some areas are sealed, and others you will have sanded through the sealer… so blotch is obviously a huge battle for refinishing. I often will wipe the piece with some water to raise the grain and immediately apply the trace coat, the water will act somewhat like a blotch control to prevent getting too much color on, all you want is a light coat to act as a rod map for your sanding , it will show you any defects , scratches , etc, when the trace is gone your done. 2nd….. this is for figured woods , as in curly, quilted , etc. then repeat with a wet coat and sand to 180 then your ready to do a final dye and topcoats. As stated above the object here is make it blotch as much as possible, in this case the blotch is attractive , so we want to enhance it. This technique not only gives you the road map, but allows the figure to be dyed 3 x times . I often will use a slightly darker dye for the trace, this works well. if the oil has dried all you can do is sand it down really well and wipe it with some water or mineral spirits to see if the blotch has been removed . Of the 50 or so articles you read you must have missed this one on blotch control. Another one on that page for blo, oils, and poly wipe on finishing.